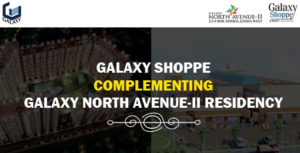 Galaxy Shoppe is a complementary commercial center for Residential apartments of Galaxy North Avenue-II. Now, residents don’t need to go anywhere for shopping and they get all their needs fulfilled! Apart from that, both the complexes are on top of their pursuits providing a real international experience to be felt and shared with people you care! Very large and spacious campus area of Galaxy North Avenue-II is skillfully designed to cater all the advanced facilities in the vicinity. Giant swimming pool with seating facility for many, adjoining children park, green walking area, and amazing landscaping are a few rarest scenic sights, creating great ambience for the residents and visitors of the residency. The whole environment is designed, keeping in mind, the safety and comfort, ladies, senior citizen, and children; because, they spent most of the time inside. Whereas, adjoining Galaxy Shoppe is equipped with a special terrace restaurant of about 4000 sq. ft. 5 Screen cinema multiplex, multi -level mechanical car park, and 12 ft. high ceiling office space are the special features of the commercial plaza. The complex is designed with special care towards women and children by providing feeding and cleaning zone. Also, fun and game zone for kids are also the highlights of the center. So, if you are planning to extend your business in a new area, then Galaxy Shoppe will be the best to start. You will have more than 3 lakhs residents as prospective clients to visit now or after. Also, they will have strong purchasing power to invest on brands. Therefore, you can think of starting a new venture to flourish in a lavish way. You can own the ATM, bank, office space, a shop in food court, retail, doctor’s clinic, spa, and more! And, you have luxury to own a home nearby!